The 19th annual imagineNATIVE Film + Media Arts Festival returns October 17-21, 2018, but imagineNATIVE is kicking off celebrations early by commemorating National Indigenous Month in June with several FREE events across Ontario. 2167 is an innovative virtual reality and immersive media project, created by imagineNATIVE, in partnership with TIFF, Pinnguaq and the Initiative for Indigenous Futures (IFF) with Indigenous filmmakers and artists Danis Goulet, Kent Monkman, Scott Benesiinaabandan and the interdisciplinary arts collective Postcommodity bringing their own artistic visions in two- to four-minute virtual reality experiences of Indigenous life 150 years in the future. For National Indigenous History Month Celebrations, these four works will be available for FREE 2167 Drop in Viewing at imagineNATIVE’s office for the entire month of June. Inclusive Arts London’s Bridging Forward: Accessibility Arts Festival is bringing exciting works from local, provincial, and national artists to London over June and July 2018. imagineNATIVE is partnering with the Festival to present a FREE screening of Alanis Obomsawin's Our People Will Be Healed at the Festival. The screening will be followed by a discussion with imagineNATIVE Programming and Tour Coordinator, Judith Schuyler. For National Indigenous Month. imagineNATIVE is partnering with Halifax Independent Filmmakers Festival to present works from our virtual reality project, 2167 in Halifax. The imagineNATIVE VR presentation is a free interactive feature of the festival and will be available in the lobby of the Neptune Scotiabank Stage Theatre on Friday June 8 and Saturday June 9 before, in-between, and after screenings at the Festival. The Canadian Sport Film Festival brings together the theatre of sport and the medium of film to tell world-wide human stories. We're co-presenting Roxann Whitebean's short film Little Hard Knox and Meke by Tim Worrall at the Festival this year. Visit the Canadian Sport Film Festival website for screening details and timings. imagineNATIVE co-presents the documentary MANKILLER at Bloor Cinema on June 9. The powerful documentary pays tribute to the extraordinary legacy of Cherokee Nation’s first female Principal Chief Wilma Mankiller and shares how she overcame numerous challenges with unparalleled passion and strength. MANKILLER screens as part of the Luminato Festival Game changers series which celebrates revolutionary women who changed the rules in politics, art, civil rights and beyond. In collaboration with the City of Mississauga, imagineNATIVE is presenting the Journey Through Turtle Island Shorts Program at Mississauga Celebration Square on June 20. This collection of short films from Indigenous filmmakers includes the following films: Holy Angels, KEEWAYDAH, Kéwku, Lelum, Three Thousand and Creatura Dada. Presented by Fort York and the Mississaugas of the New Credit First Nation, the Na-Me-Res Annual Traditional Pow Wow and Indigenous Arts Festival will celebrate Indigenous culture and energize the grounds of the National Historic Site at 250 Fort York Blvd, Toronto with compelling creations by Indigenous artists, including traditional and contemporary music, educational programming, storytelling, dance, theatre and food. Visit us at our booth at the Festival, meet the imagineNATIVE staff, and win some prizes! 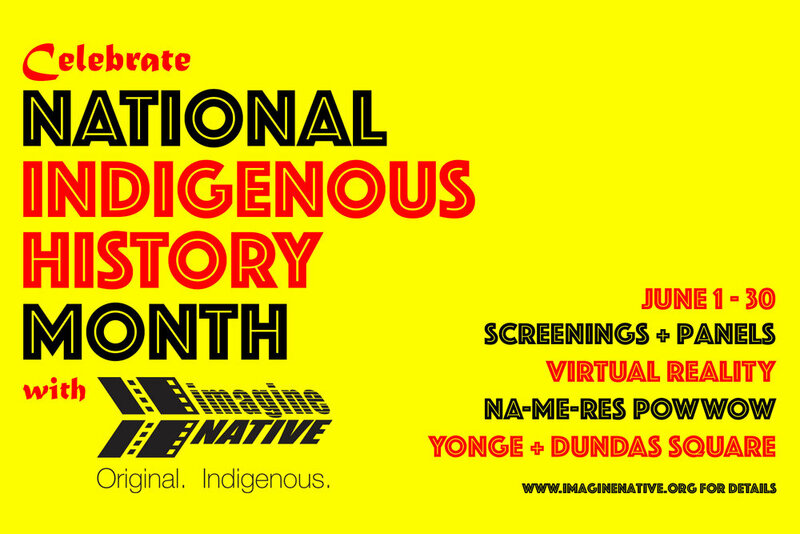 imagineNATIVE returns to Dundas Square for the annual National Indigenous Month celebrations in the centre of downtown Toronto. Drop by our Booth at the Square to meet our staff and find out all about our 2018 Festival, and also win some prizes, including all-access passes to the Festival! 2167 is an innovative virtual reality and immersive media project, created by imagineNATIVE, in partnership with TIFF, Pinnguaq and the Initiative for Indigenous Futures (IFF). Indigenous filmmakers and artists Danis Goulet, Kent Monkman, Scott Benesiinaabandan and the interdisciplinary arts collective Postcommodity bring their own artistic visions in two- to four-minute virtual reality experiences of Indigenous life 150 years in the future. 2167 has been travelling the country following the Festival in October last year. For National Indigenous History Month Celebration, the four works will be available for viewing at imagineNATIVE’s office for the entire month of June. The imagineNATIVE VR presentation is a free interactive feature of the festival and will be available in the lobby of the Neptune Scotiabank Stage Theatre on Friday June 8 and Saturday June 9 before, in-between, and after screenings. The Canadian Sport Film Festival brings together the theatre of sport and the medium of film to tell world-wide human stories. We're co-presenting Roxann Whitebean's short film Little Hard Knox and Meke by Tim Worrall at the Festival this year. The powerful documentary pays tribute to the extraordinary legacy of Cherokee Nation’s first female Principal Chief Wilma Mankiller and shares how she overcame numerous challenges with unparalleled passion and strength. The film screens as part of the Luminato Festival Game changers series which celebrates revolutionary women who changed the rules in politics, art, civil rights and beyond. Presented by Fort York and the Mississaugas of the New Credit First Nation, the Na-Me-Res Annual Traditional Pow Wow and Indigenous Arts Festival will celebrate Indigenous culture and energize the grounds of the National Historic Site with compelling creations by Indigenous artists, including traditional and contemporary music, educational programming, storytelling, dance, theatre and food. Visit us at our booth at the Festival, meet the staff, and win some prizes! imagineNATIVE returns to Dundas Square for the annual National Indigenous Month celebrations in the centre of downtown Toronto. Drop by our Booth at the Square to meet our staff and find out all about our 2018 Festival and win some prizes, including all-access passes to the Festival! Up Close and Interactive - The VR/AR Residency Wrap-Up with Nyla Innuksuk! imagineNATIVE and Virtual and Augmented Reality resident, Nyla Innuksuk, welcomes you to come learn, be inspired and interact with projects she has been working on as we close out the iNstitute’s Spring Series.